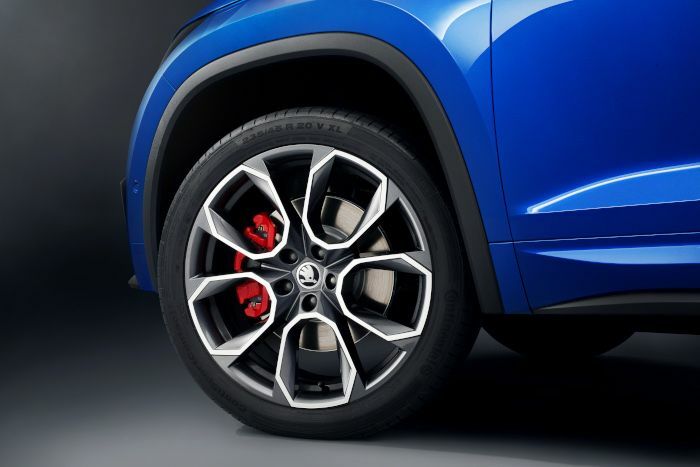 ŠKODA KODIAQ RS, celebrating its world première in Paris this October, will be the brand’s first ever model to feature 20-inch Xtreme wheels as standard. Sheltering behind them are seventeen-inch brakes with red brake calipers. 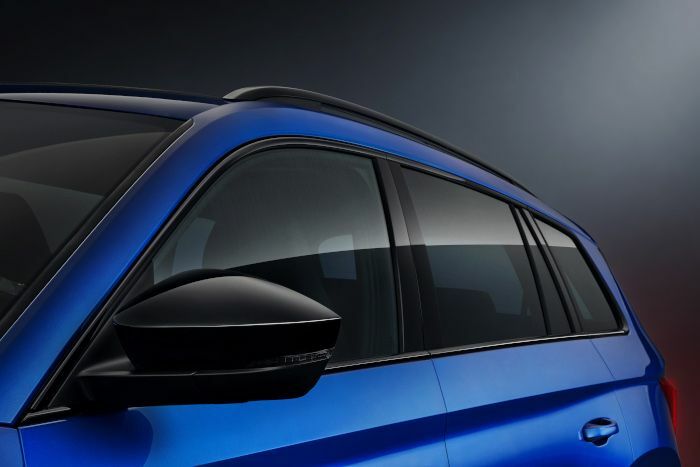 ŠKODA’s most powerful SUV will also set itself apart from its siblings in the model range with a multitude of black accessories. The grille, wing mirror covers, side-window trim and roof rails are all in high-gloss black. 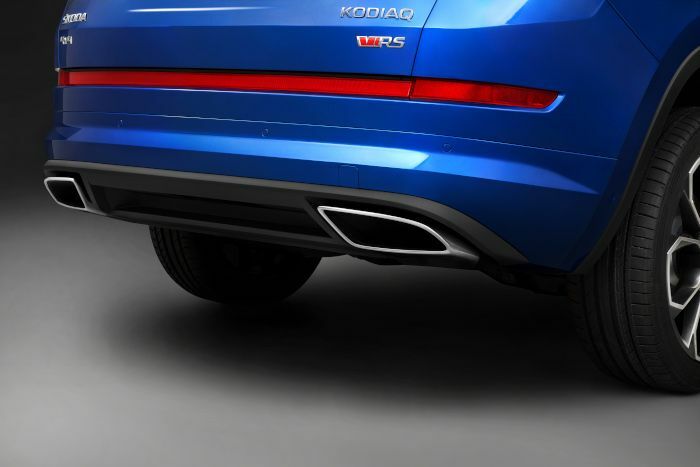 The rear is shaped by two visible tailpipes below the bumper and a red retroreflector that extends across the entire width of the rear bumper – the distinguishing feature of all ŠKODA RS models. The “RS”, which stands for “Rallye Sport”, was first used on the ŠKODA 180 RS and 200 RS rally prototypes back in 1974. 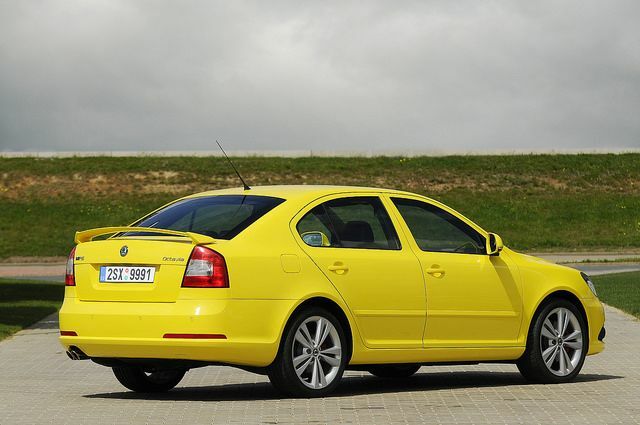 In 2000, ŠKODA introduced its first mass-produced RS model – the OCTAVIA RS. The „RS” badge gets a new design on the Kodaiq RS, which will be worn by newer RS models. The OCTAVIA Mk.1 facelift was launched along with the model’s most dynamic version. The RS featured a supercharged 1.8 litre four-cylinder engine that produced 132 kW (180 hp) of power transmitted to the front wheels. The car’s maximum speed was 235 km/h (146 mph), and the 0 to 100 km/h (0-62 mph) acceleration time was 7.9 sec. In addition to this liftback, the brand launched also an estate in 2002 (max. speed 231 km/h „143,5 mph”, acceleration 8.0 s). The vehicle was manufactured in Vrchlabí. 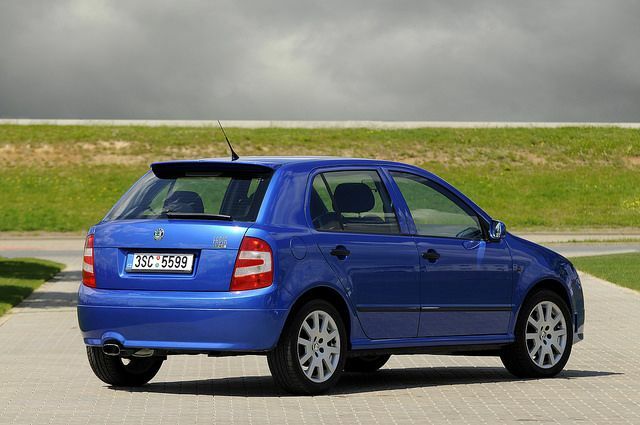 In 2003 the ŠKODA was extended the RS model range, which is a new member of Fabia RS. ŠKODA’s first hot hatch was fitted with a turbocharged 1.9 TDI PD engine (96 kW). The Fabia RS acceleration from 0 to 100 km/h 9.6 sec, maximum speed 204 km/h. ŠKODA launched the RS version, in both liftback and estate versions, one year after the premiere of the OCTAVIA II. Customers could choose between two engines, a 2.0 TFSI 147 kW (liftback and estate, maximum speed 240 km/h and 238 km/h, respectively, acceleration from 0 to 100 km/h 7.3 sec and 7.5 sec, respectively) and a turbodiesel 2.0 TDI 125 kW (liftback and estate, maximum speed 225 km/h and 224 km/h, respectively, acceleration 8.5 sec and 8.6 sec, respectively). The car was available with a six-speed automatic DSG, as an option. In 2011 the OCTAVIA RS Bonneville Special achieved a speed of 365 km/h on a salt flat in Utah to become the then fastest “production car with a supercharged petrol engine of under two litres”. 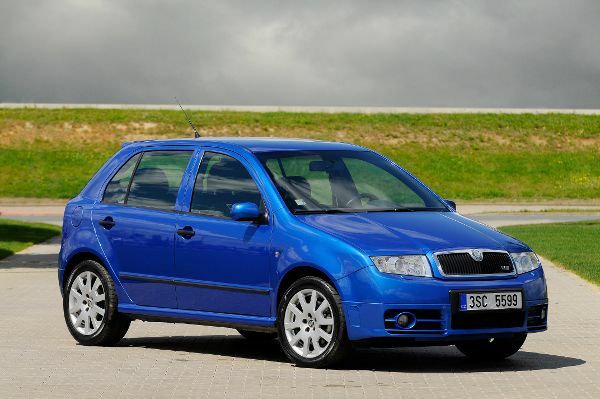 The RS version also came from the Fabia 2-gen, and just three years after the Fabia Mk2 (2007) premiere. The new Fabia RS used a small 1.4 TSI turbocharger petrol engine, which is produced 180 hp (132 kW), and the engine combined with a 7-speed dual-clutch automatic DSG transmission. 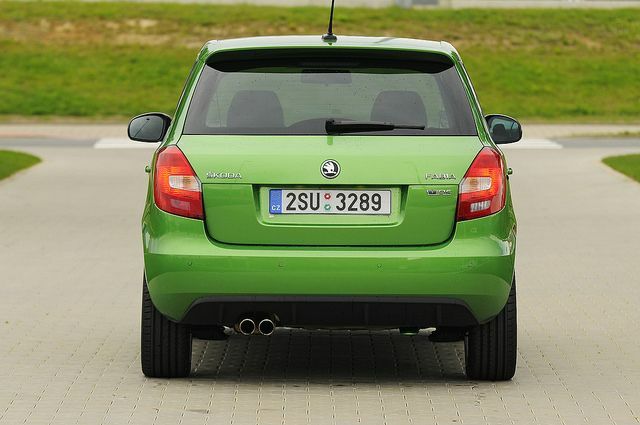 The small turbo Fabia top speed 224 km/h (hatchback) and 226 km/h (estate), acceleration 7.6 sec in both versions. 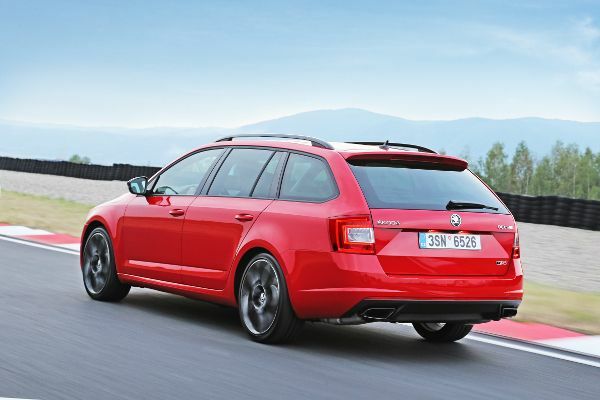 ŠKODA introduced its fastest model in 2013, at the Goodwood Festival of Speed (in july), which is available liftback and estate versions. The liftback with a 2.0 TSI 169 kW engine and a manual gearbox accelerates from 0 to 100 km/h in 6.7 sec and achieves a maximum speed of 250 km/h (electronically limited). The estate’s maximum speed and acceleration are 247 km/h and 6.8 sec, respectively. The 2.0 TSI engine is also available in combination with a six-speed dual-clutch DSG. The 2.0 TDI engine produces 135 kW (184 HP) of power, enough to enable the liftback to accelerate from 0 to 100 km/h in 7.9 sec and achieve a maximum speed of 232 km/h (estate: 230 km/h and 8.0 sec). The 2.0 TDI is also available in combination with a manual six-speed gearbox or a six-speed dual-clutch DSG and, for the first time ever, also in combination with four-wheel-drive (max. speed and acceleration 225 km/h and 7.6 sec, respectively, estate 224 km/h and 7.7 sec, respectively). In September 2015 the portfolio was extended with the RS 230 as the top-end version. As implied by its name, the most powerful OCTAVIA of that time produced 230 HP of power. Maximum speed electronically limited to 250 km/h, acceleration from 0 to 100 km/h in 6.7 sec. 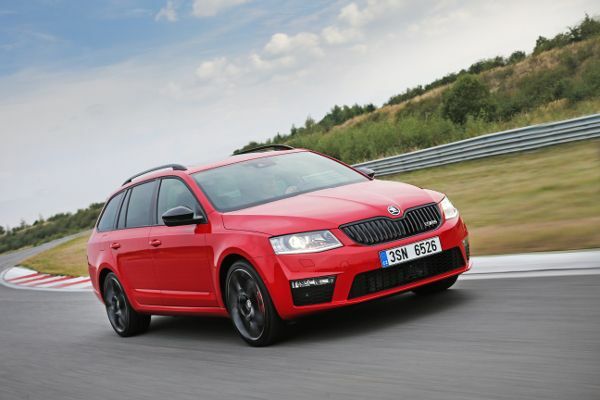 The currently most dynamic ŠKODA is the OCTAVIA RS 245. The car boasts a power output of 180 kW (245 HP) and a maximum speed (electronically limited) of 250 km/h, and needs only 6.6 sec (estate 6.7 sec) to accelerate from 0 to 100 km/h. As standard, the car features an ESC system with a sport mode and an electro-hydraulically controlled front limited slip differential (VAQ).